Red-bellied lemurs in Ranomafana National Park, Madagascar. Researchers who observed nine of the animals there could clearly see them sniffing fruit and deciding whether to eat it based on how it smelled. A red-bellied lemur feeds at dusk in Ranomafana park. 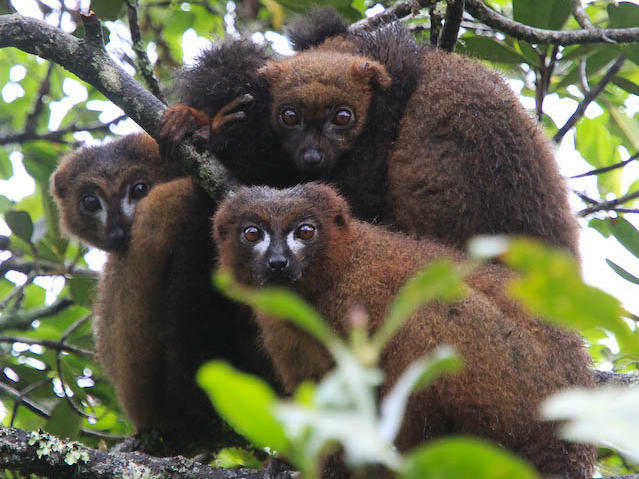 Researchers found that the more a fruit is known to change scent when ripe, the more the lemurs appeared to be smelling it. As a researcher looks on, a lemur takes a long whiff of a fruit growing from a tree in an eastern Madagascar rainforest. It passes the animal's test. The lemur takes a bite. Seconds later it sniffs at another fruit on the same tree. This time, it's not interested. A group of researchers set out to test what kind of information the animals are able to discern from scent about whether a fruit is ripe. In a paper published in Science Advances, they say that fruit plants can evolve to signal to animals that it is ripe using their scent. This helps certain fruits that rely on animals to distribute their seeds. Omer Nevo is one of the authors of the study. He's an evolutionary ecologist at Ulm University in Germany, and he says it has long been speculated that fruits have evolved to attract the animals that scatter their seeds. That could mean scent — for those that rely on animals such as lemurs that are partly colorblind and otherwise have relatively poor vision. There are other kinds of fruits that appear to have evolved to be colorful when ripe — more likely to attract animals that rely more on sight, such as birds. Other scientists have argued previously that scent is simply a byproduct of certain fruits reaching maturity. Nevo says that fruit characteristics such as size or color have been studied in greater detail than scent because those are easily measurable using a tape measure or a simple instrument. He says it takes several hours to obtain a scent sample and then an additional long process to identify "often dozens if not hundreds of different individual chemicals" in a lab. "It's much more work, and I think that's a major reason why it lagged behind," Nevo adds. "And the idea was that birds have presumably a lower reliance on their sense of smell and they have really, really good color vision, so they tend to focus on visual cues like food color," Nevo says, "and then the expectation is that in these fruits, you would see less pressure on the plants to signal ripeness through the scent of the fruit." On the other hand, for the plants that rely on lemurs, "the idea was that if fruit scent is a signal for animals, what you'd expect to see is that the scent of ripe fruit is very different from the scent of unripe fruit," Nevo says. "And that's exactly what we found." The fruits that rely on birds had very little smell difference between unripe and ripe pieces. "This showed us that this change in the amount and in the chemical that is emitted by fruit in the lemur-dispersed species is not an inevitable byproduct of the fruit-ripening process, it's not something that characterizes all fruits but something that is unique to fruit for whom it would be useful," Nevo says. "Because the animals use the scent." The researchers also observed nine red-bellied lemurs in the park, and they could clearly see them sniffing fruit and deciding whether to eat it based on how it smelled. "If a species tries to convey information on ripeness through scent, if it changes its scent a lot when it becomes ripe, the lemurs would be more motivated when they feed on this fruit to sniff the fruit before they decide whether to ingest it or to reject it," Nevo says. He adds that the more a fruit is known to change scent when ripe, the more the lemurs appeared to be smelling it. 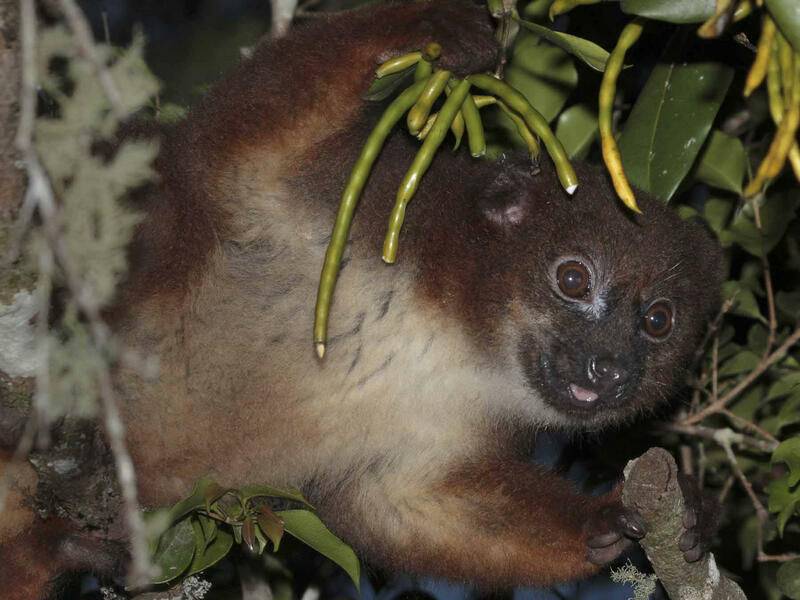 The situation for fruit scent in Madagascar may be particularly dramatic, he says, because of the many plant species that rely on only lemurs – and their poor vision — to distribute seeds. "It could be that in other systems it is first, weaker, and second, also a bit masked by other changes, by other fruit traits," he says. For example, if a plant relies on many different animals, including some with better sight, it would probably be less likely to evolve a strongly different smell when it becomes ripe.